Coming into this weekend’s event here in Little Rock, Arkansas, we all still had the happenings for last weekend’s events in Arlington, Texas still fresh in our minds, just as the 35 bull riders competing at the Bad Boy Mowdown would as well. All of them would be hoping to carry on the momentum that they gained just a few short days ago to be able to carry themselves to an event win inside the Verizon Arena tomorrow night. Although aspirations would be high, that task would be far from easy as round one and the ABBI Classic bulls would, once again, stare them right in the eye, striking the nerves of many of those sitting in the locker room. Many of the match-ups may look favorable on a sheet of paper but making those statistics happen might be another story as round one was set to take place later in the night. Coming into this event, both Ramon de Lima and Jess Lockwood would be riding a high wave of emotion following big wins at both the Iron Cowboy and the RFD-TV’s The American events. Lima, who took home the Iron Cowboy win that shot him to the number one spot in the world standings would be one to watch to see if the pressure would be too much for him to handle while the other focus would be on the reigning and defending PBR World Champion Jess Lockwood. Five short nights ago Lockwood would add his name to the history books while taking home a $100,000 payday and leave Texas with the title of RFD-TV’s The American Bull Riding Champion, giving him all the confidence in the world that he hoped to carry on into the Bad Boy Mowdown event here this weekend! To say that tonight’s round one was dominated by the bovine athletes of the American Bucking Bull Incorporated (ABBI) would be a complete underestimate of what we all witnessed down on the arena floor earlier tonight as the top bull riders in the world were left scratching their heads once again. If anyone would have come into tonight’s round saying that we would struggle to even be able to fill out the seven spots that points were available in no one would even begin to believe that after what we all watched throughout last weekend’s events in Arlington, Texas. Both the Iron Cowboy and the RFD-TV’s The American gave us all many great moments of stardom as the top bull riders in the world put on a showcase as the second PBR major event of the 2018 season took center stage. Tonight though, that is exactly what played out as the top 35 bull riders in the world once again paired up with the up and coming superstars of the ABBI Classic bulls that also featured a mix of first-time outs from some that were trying to make a name for themselves too. After all was said and done, it would be the bovine athletes that would prove too much for the cowboys to handle on a Friday night here in Little Rock, Arkansas, giving not only the fans and riders but the Director of PBR Livestock Cody Lambert, a lot to think about and ponder after watching them come into the Verizon Arena with guns blazing. Following tonight’s round, the door would remain propped open with the hinges lown completely off for any one of the guys in the locker room to make it back to the championship round tomorrow night with a solid performance in round two! As the first round of the Bad Boy Mowdown was getting ready to begin, many of the fans watching live and on the new Ride Pass Platform were wondering exactly how things would play out as we would again see the ABBI Classic bulls here tonight. Throughout the course of history, we all know that these rounds could bring us some major rides or could completely lean the opposite direction and prove to be much more than the top bull riders in the world could handle. Either way, all of us watching knew it would either be a big night for the cowboys in the locker room or a huge might for the up and coming bovine athlete superstars that the ABBI continues to bring to the forefront. That being said, we would all soon find out exactly how the night would play out as round one was set to begin down on the arena floor! As round one began and the 2018 Bad Boy Mowdown took center stage, the questions that remained were soon answered as the judges down on the arena floor did not have to work too hard here in a Friday night underneath the lights of Verizon Arena. It would not be until about halfway through the round that we would even see our first qualified ride which we all began to think might have been the only one. After all was said and done there would only be seven that would manage to make it to the eight-second buzzer, leaving eight empty seats that still would need to be filled for the championship round tomorrow night. 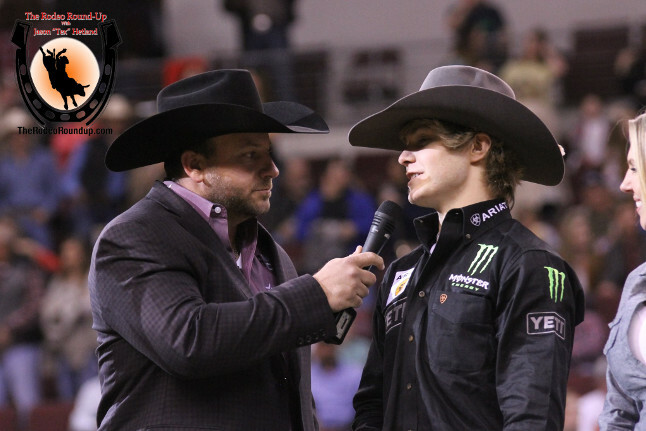 Even though the rides were few and far between the Washington State cowboy, Derek Kolbaba, would be the one smiling the most after ringing home the round one win aboard K-C Bucking Bulls / TCB Ranch’s Bottom’s Up to the tune of 89 points, sending him into tomorrow night as the man to beat here in Little Rock! Once the final ride was made and the fans began to make their way out of the Verizon Arena earlier tonight, the shock and awe of what was witnessed earlier could be felt throughout the entire crowd. Even though only seven qualified rides were made here tonight, the fans that were returning tomorrow evening were extremely excited as we all are about the possibility of what we could see in the final day of action here in Little Rock. As seven rides were tonight, that will leave the door wide open for anyone to make it back to the championship round tomorrow if they can change the tide that was set tonight by the bucking bulls of the ABBI. That being said, we will all have to wait and see if the guys in the locker room can come back with a clear mind and begin to right the wrongs that we all watched tonight!